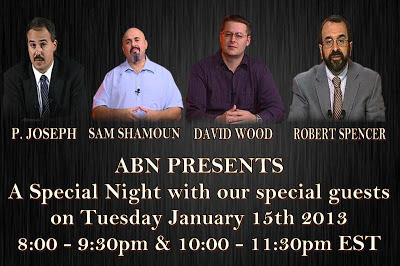 Answering Muslims: Two ABN Specials This Tuesday! Two ABN Specials This Tuesday! 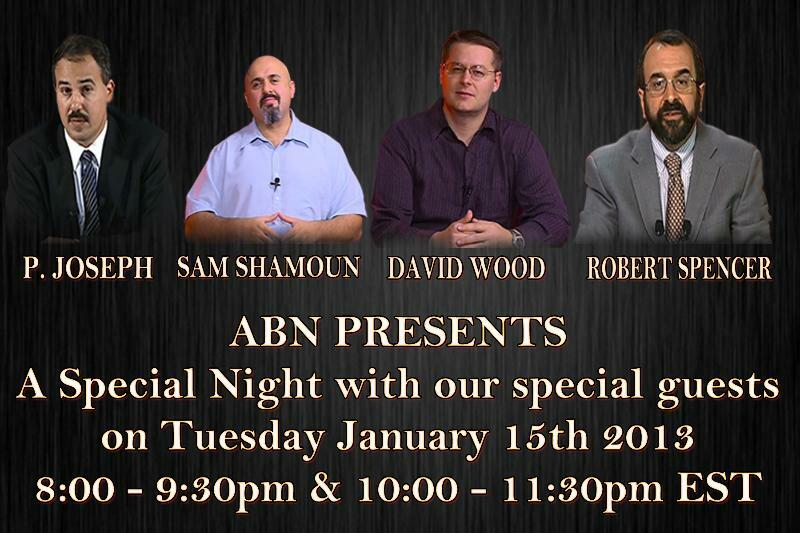 I look forward to seeing all of you on ABN. ..will have popcorn; but it's better than the movies. All four on the same show??? That would be incredible. Oops, I see now. Two shows. Probably one for Spencer, and one for the other three. Way cool. Yes, all four on the same show. Two of them. We'll most likely be talking about CAIR's new "My Jihad" campaign, as well as Huffington Post's recent comparison of Muhammad and George Washington. G,day Guys, Thanks for your work here. I have been following your posts for a while now. I decided to read my Bible cover to cover. which I have now done twice. and then realised I needed far more background info to really understand much without other commentary, which slows down the process some what. Im slow reader. So I looked into the textual history etc. and I forget how I got to it but I ended up reading the Koran for the first time. I am HORRIFIED by what I read. My wife is a Catholic from eastern Indonesia and are a large minority in the country (about 15% I think) and I immediately felt PLAIN AND CLEAR the enmity and menace that is ever undercurrent In that society. I have made some observations on your old Debates and some other point of interest or Questions but felt the the comment section is out of date but to bring them to the most recent post seem to be out of context also. I will say also that Im not theological whizz. and intellect and knowledge is not king, BUT for Discernment and Wisdom. Thanks be GOD. This is the way forward. I'm very happy and I congratulate the one who came up with this great idea. Thank you so much it is high time to put aside our differences and face the devil, because divided we failed united we succeed. Wow. The four of you guys together. Now that is going to be AMAZING. What an irony. The very religion that claims to distinguish most between God and human beings is the one with the most human beings who haven't a shadow of a doubt that their own conception of God's laws is utterly indistinguishable from God's own conception -- that their minds in that regard are indistinguishable from the divine mind, so much so that they have a right to impose their concepts by dictatorial force on everyone else. In that sense, despite its hype as "submission" to God, Islam actually teaches Muslims to confuse themselves with God. Thus if God exists, Islam is some sort of blasphemy, and orthodox Muslims are among the worst blasphemers, because they raise themselves above the human level and arrogate to themselves the right to dictate to other human beings. This is going to better than if the good Terminator (Schwarzenegger in T2) were to join Kirk, Spock, and McCoy to save the Federation.